Earlier this year I was in NY for work; I made it a point to make time to photograph Natalie and Max, her gorgeous Bernese mountain dog who had just turned one year old. We spent a lazy Sunday morning strolling around her neighbourhood in Jersey City chatting and being stopped frequently by Max’s multitude of admirers who wanted a quick snuggle or photograph with him. Natalie was born & raised in the small town of Prescott Arizona, but now calls New York home. She moved to New York to join her then boyfriend-now husband Chris (who also hails from Arizona), leaving her job at the San Diego Film Festival. She joined the ranks of publisher Conde Nast, where she currently works for the brands of their Beauty Collection. 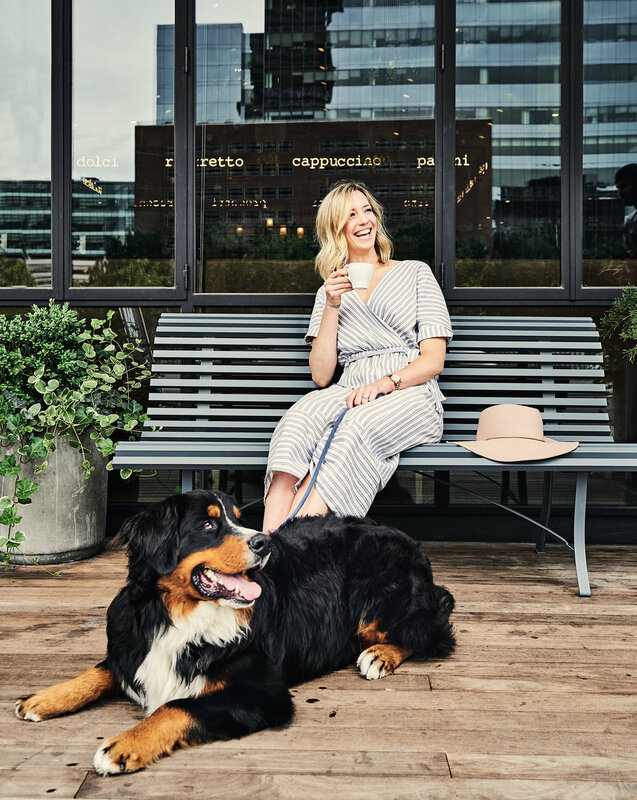 Natalie embraces all that New York has to offer; access to the amazing food scene, patio roof tops in the summer, the fact you can always find something interesting going on no matter the time of day. But the one major drawback of pursuing their careers in NY is being far from family. Eventually Natalie & Chris would love to move west to be closer to their families. If and when that move does happen, Natalie is keen to follow the entrepreneurial footsteps of her parents who run two successful companies; custom home construction & high-end unique wedding rentals. What sort of business will they start? They aren’t quite sure yet, but it has to be something that gives Nat a creative outlet; one idea that they mused about was having a brewery where Max would play a part and make the perfect mascot. For the time being they are content in New York which is the perfect jumping off point for their favourite hobby; travel. Next on their list of places to visit; Hong Kong, Vietnam, & Norway. As we sipped our lattes our conversation drifted inevitably back to the giant bundle of fur and drool, Max. I was curious why they would chose such a large dog when living space in NY comes at such a premium. Nat & Chris both grew up with big dogs and knew they always wanted one. Last fall they decided to take the plunge after having put it off for a long time due to their careers and crazy NY life schedules. Nat's sister pointed them towards Bernese mountain dogs. "We would see Bernese Mountain Dogs on all our ski trips. Every time I’d make a point to say hi and fell in love with each one we met. They have such wonderful temperaments, are great with all people, kids and dogs, and surprisingly are good apartment dogs as long as they get enough exercise." Max is the perfect antidote to the hectic hustle & bustle lifestyle of New York. "He is good for the soul. He is our shadow when we are home. He gets so excited every time we come home, even if you had just been gone for 20 minutes." No matter what stressful thing happened during the day, a few minutes with Max melts it all away.